Falmouth Yacht Sales would love to guide you through a personal showing of this 114' Aydos Yatcilik 2012. 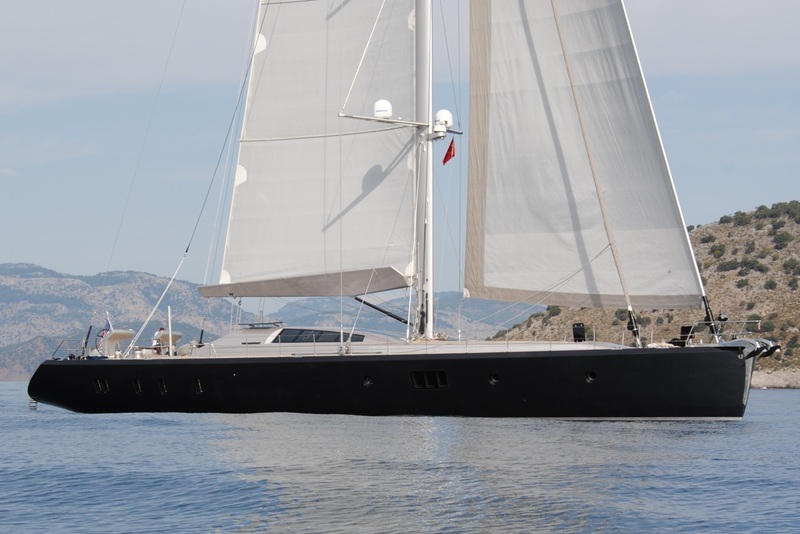 This yacht for sale is located in SARDINIA Italy and priced at $4,995,884. For a showing please contact us by filling out the form on this page and we will get back to you shortly! The 114-foot (34.7m) Aydos Yatcilik MUSIC is a modern cutter rig performance cruiser that was delivered in August 2012. She represents a unique opportunity for anyone looking for a relatively late model yacht at a very attractive price. She is well suited for both long-range cruising and day sailing in total comfort thanks to her very large and protected cockpit, full-beam raised salon and generous guest accommodations. Her simplified controls and well-thought-out engineering mean easily handling. Her unique tender garage and swim platform transforms into a “teak beach” at the push of a button, making water access incredibly convenient. MUSIC is pleasure to show and a delight to sail in all wind angles. Sailing yacht MUSIC features a very spacious, functional layout with accommodations for eight guests in four large, comfortable staterooms. Five crewmembers are accommodated aboard the yacht to ensure total five-star service. From her bright and airy salon, a companionway forward accesses the VIP cabin to starboard and to port to the galley and crew area. Another companionway aft leads to the master and guest cabins as well as up to the large protected cockpit deck. The full beam Master Stateroom is beautifully finished with Walnut bulkheads and a natural Oak sole. It features a centerline queen berth with a large leather settee and vanity to port and drawer storage to starboard. Two large hanging lockers and storage areas are located forward with a large en-suite head outboard to port and very large steam/sauna shower outboard to starboard. Also finished in Walnut bulkheads and a natural Oak sole, it features a full walk-around Queen berth with port and starboard nightstands, large hanging locker, generous amounts of drawer storage and a large en-suite head with stall shower. Finished in Walnut bulkheads and a natural Oak sole, it features two twin berths, a large hanging locker, generous amounts of drawer storage and a large en-suite head with stall shower. The full beam VIP (easily considered a second master stateroom) is entered via its own private companionway; it is also finished with Walnut bulkheads and a natural Oak sole. It features a centerline queen berth, massive amounts of storage, a port side vanity/desk and a large comfortable chair and ottoman to starboard. A large walk-in hanging locker and mirror with TV hidden behind are located on the aft bulkhead and a large en-suite head with stall shower is located outboard to port. Full beam and bright and airy, a dining table and area is located to port while a large L-shaped leather settee is located to Starboard. Finished in keeping with the accommodations with Walnut bulkheads and built in furnishings and a natural oak sole. A large amount of glass on the sides and overhead create a wonderfully open feel. Accessed via the port side companionway from the Salon, the Galley is aft and partially under the salon. Premium equipment and plenty of cold and freezer storage ensure any Chef will be prepared for an extended cruise. Located in the bow and accessed either by a foredeck hatch or from a companionway in the galley/technical area. Spacious accommodation for 5 crewmembers in three cabins and an L-shaped dinette and seating area. The entire area is finished with maple bulkheads and a natural oak sole. The majority of the technical space and equipment is very accessible and located in a full stand-up engine room under the Salon and forward under the VIP Stateroom.